After yesterday’s practice run, today's airport activities were a breeze and before we knew it we were in Madeira revving up the engine on our little Clio rental car and launching out of the airport parking lot on a hot, sunny, and cloudless day. 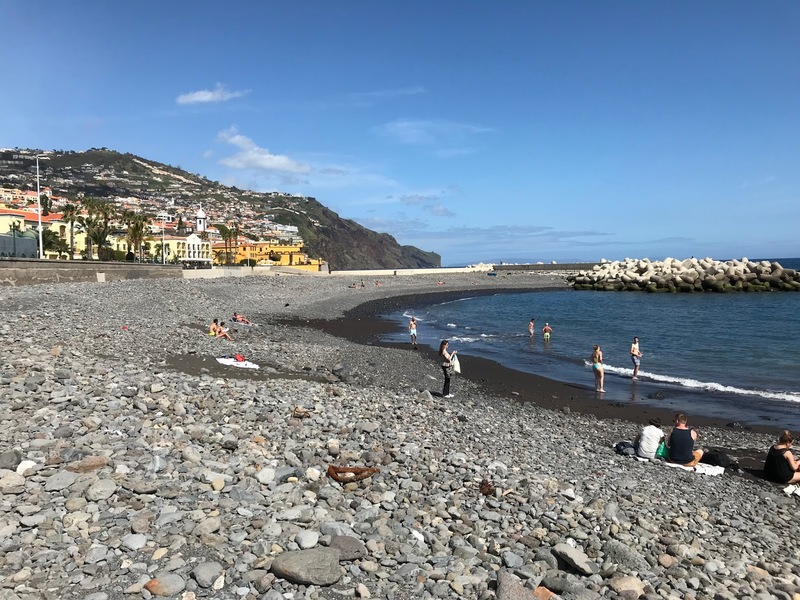 It didn’t take long to realize that Madeira is a much busier place than Sao Miguel, and there are a lot more people here - tourists and locals. The highways are mostly separated, double lanes, passing through frequent mountain tunnels. Houses hang off the steepest of cliffs, in the most improbable of places, with no obvious road leading up to them, making one wonder how they got all the construction materials there in the first place. The mountains seem to start right from the shoreline, giving practically every house a beautiful, ocean view. It is strikingly beautiful. 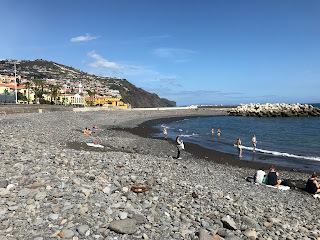 We navigated our way into Funchal, the capital city, and after a dangerously steep, nail-biting road leading down into the centre we found the apartment building in which we had rented an Air B&B. Our host met us and helped us get parked into an incredibly tight space, after driving up an incredibly steep driveway, from an incredibly busy street. The apartment was fantastic - two bedrooms, impeccably clean, television with a Wii for the kids, large, comfortable beds, and a balcony with an ocean view. After getting settled, we walked a short way towards the city centre and came across a wide-open plaza with many restaurants and outdoor seating. We chose an Italian restaurant and enjoyed a delicious lunch, in fact, one of the best of the trip. The surroundings were lovely - tall buildings, mostly locals, cobbled streets, and many small shops. We continued into the main centre and found a bustling and fun atmosphere, full of so many locals and tourists, enjoying the lovely day. We wandered around, exploring the area, and found a farmers market, a large marina, a gondola leading far up into the hills, an area with the best public gym equipment I’ve ever seen (think parallel bars and rings), and a beach composed of a small patch of midnight black sand and an expansive area of small, fist sized rocks, that people were lying on, sunbathing. I dubbed it “Die Hard” beach, because you’d have to be a real sun worshipper to spend the afternoon lying on uncomfortable, hot rocks. At one point the kids sat down for a rest while Ana and I continued on. We were gone quite a long time, so the kids eventually caught up with us and Stella asked what we’d been doing. Magnus said we probably snuck away for a “6 second slopper”. Ana and I looked at each other, and then back at Magnus, eager for an explanation. He said it was when you kissed each other, but it lasts longer than normal. Ana said the word for it was “necking”, but then realized nobody’s used that term for about 30 years, so we decided on “making out” which everybody could understand. Ana and I then made out for 6 seconds, in way of a short demonstration, which grossed out Stella and just made Magnus laugh. After a short chill-out session in the room, we returned to the centre and found an area called the Zone Velha (Old Town), which was a series of slim pedestrian-only streets, lined up with restaurant and bars housed in buildings hundreds of years old. It was strangely quiet though, but this could have been because we arrived for dinner after 9 pm, but also perhaps because we were still in a shoulder season but judging by the hordes of tourists we saw in the afternoon, I was expecting it to be much busier. The walk back to our apartment took only about 15 minutes, but was quite enchanting - the quiet cobbled streets, the melancholy lighting, the ancient street names engraved on tile, and the sounds of a city winding down for the evening. It was all lovely, at least until some grubby tourist dude walked by Stella and broke wind right when he passed her. But she thought it was pretty funny.